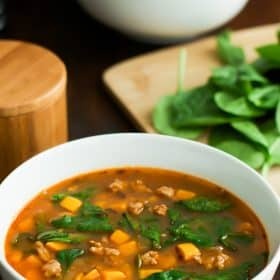 This Spinach Sweet Potato Soup is a hearty and comforting meal that is so easy and quick to make, loaded with ground turkey, sweet potato, and spinach! This week is going to be a soup week here on my blog which means Thursday I’ll be sharing one more delicious soup and on Saturday a soup roundup recipe. It is just a little way to celebrate one of the most desirable comforting winter meals. 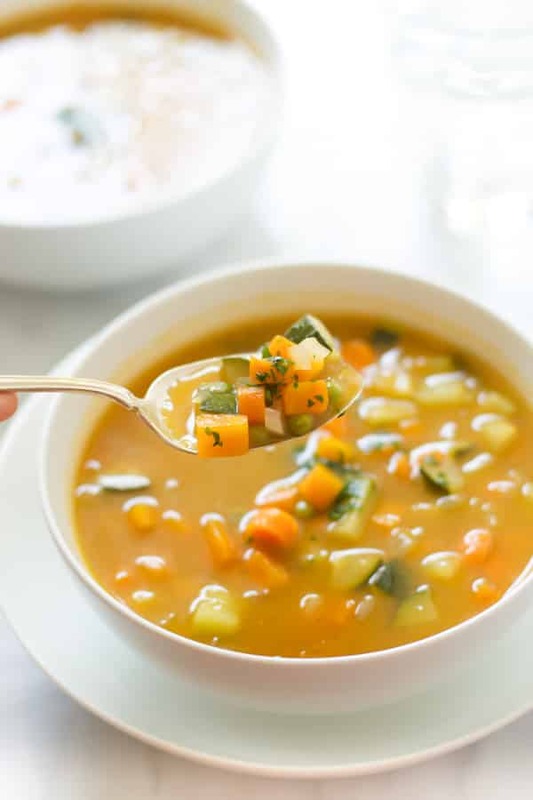 I know spring is right at the corner and the temperatures are still below zero, but while the warmer weather is coming, I am more than open to having some of my favorite soups recipes such as carrot parsnip soup or beet sweet potato soup. I enjoy these during my weeknight meals just because they are so easy to make, flavorful, and satisfying. I guess by now you guys already know I have a love affair with sweet potatoes soups. I don’t know why but sweet potato is just great and even better in soup. Maybe it’s because they are more likely to absolve all the flavors from the broth. Mmm… yummy! 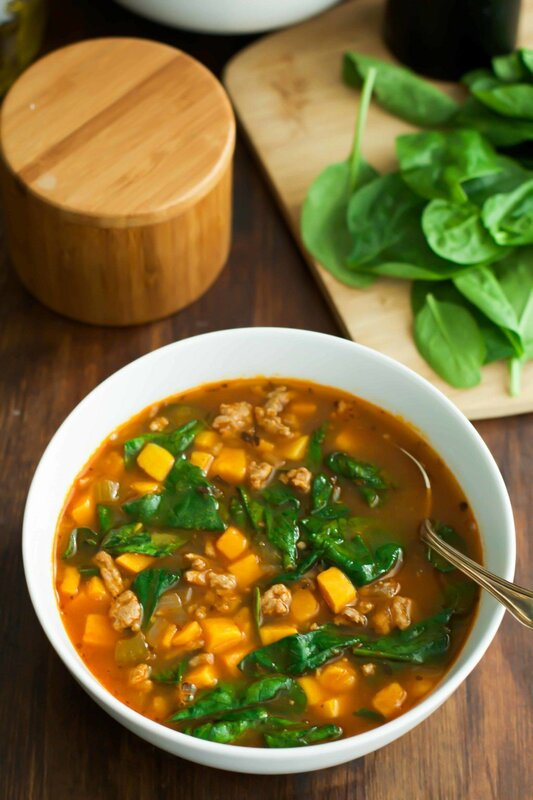 And the other great ingredient we have in the recipe is the spinach which makes this soup even healthier and tasty. I love the combination of sweet potato and spinach! 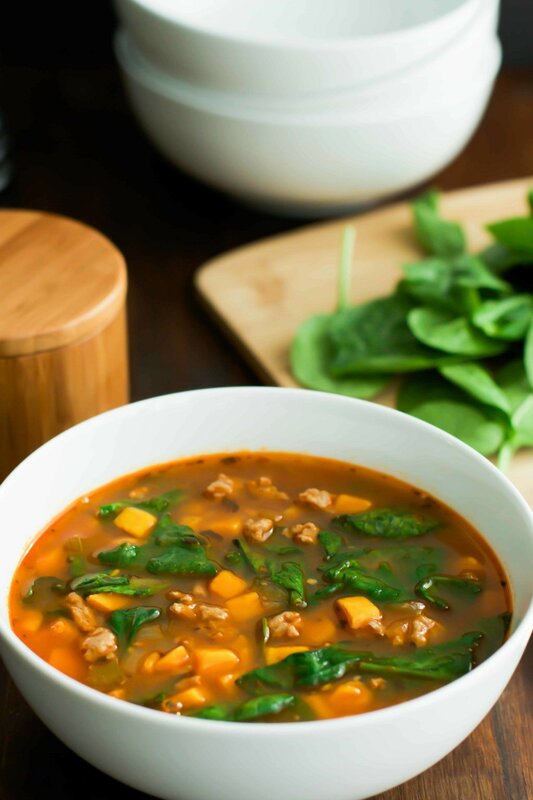 The best part of this Spinach Sweet Potato Soup is the extra-lean ground turkey that just makes this soup a complete meal with all the protein you need. And it is low-fat too. 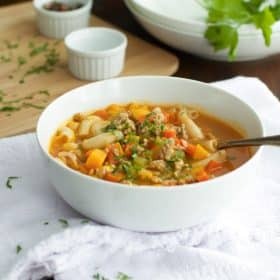 You can add as much ground turkey to your soup as you like. It just depends on how you feel. The more you add, the more filling it’ll be. Also, if you don’t have ground turkey in your fridge, you can add turkey leftovers. I am sure it will be delicious! Enjoy! In a large pot over high heat, add olive oil. When the pan and the oil are hot, turn the heat down to medium. Add ground turkey and garlic. Stir occasionally and cook for about 10 minutes or so. Add onions, celery, red peppers and dried parsley. Cook until onions are gold brown. Add the sweet potato, broth and bring it to a boil. Cook for about 10 to 15mins. Add spinach, cayenne pepper, salt and pepper and cook for 4 minutes more. Taste and add any extra seasonings, if necessary. I hope I could inspire you to go to the kitchen and roast some vegetables today. Don’t forget the more you practice, the more you learn. Thank you so much for stopping by. If you like this Spinach Sweet Potato Soup, please share with your friends and family. Do you want to taste more? Subscribe to my newsletter and follow Primavera Kitchen on Twitter, Pinterest, Google+, Instagram, and Facebook for all delicious recipes updates. As always, I really appreciate you stopping by. 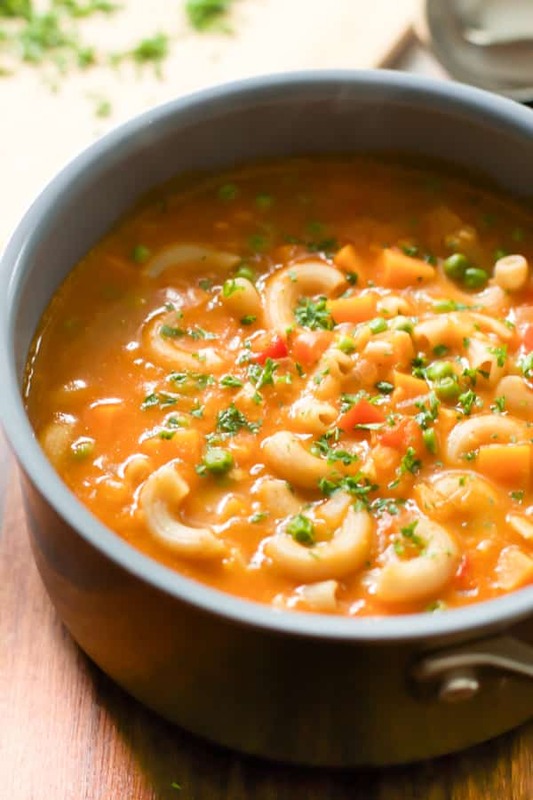 This Pasta Soup with Sweet Potato is a quick-and-easy go-to meal! Fresh and delicious Zucchini Soup! I’m with you – sweet potato in soup is the best! Although I love sweet potato in anything so there’s that 🙂 This looks wonderful! I adore soups of all kinds, but sweet potato is one that I haven’t made in quite some time! Thanks for the inspiration! Looks so good, Olivia! I love sweet potato in soup! It is a cold and rainy day here in California. Perfect soup weather! I love this sweet potato soup. Great flavor combo with the turkey and spinach. Yum! Yay for soup week! And I’m a big sweet potato fan as well! 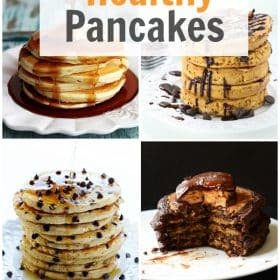 This looks hearty and delicious! Yum! I could have soup all year long especially if there’s sweet potatoes in there. This looks so comforting and delicious! Love all the ingredients in here! This soup is simply beautiful, full of textures and yummy vegetables, I can’t wait to try it in a cold night here in Tasmania with a glass of wine! So good! I made a version of this and it’s so good! Do you know the calories in a serving? Thanx! Hi, would this be just as good/flavorful if I omit the turkey and make it vegetarian? Thx! !